The Six Month Rolling Pivots (JFX System) is a state of the art rolling quarterly pivots controller with sophisticated independent alert controls, full customization options and ultra fast config and profile management capabilities. For traders looking for the ultimate in cross timeframe customisation - there is simply no finer tool on the market. The Six Monthly Rolling Pivots toolset allows the trader to control every aspect of how these important long range pivots are displayed. The table below shows the array of customisation options available to the trader. Independent JavaFX based alert system The JFX tools use a custom JavaFX alert interface which is trader configurable. Traders can also use any .wav file on their computer for audio alert purposes. The soundclip used will not clip as is the case for long duration wav audio clips triggered from MT4 indicators. Pivot Alert Threshold Channels The JFX alert system allows traders to create a chart visible trigger channel around pivot levels they are interested in monitoring. 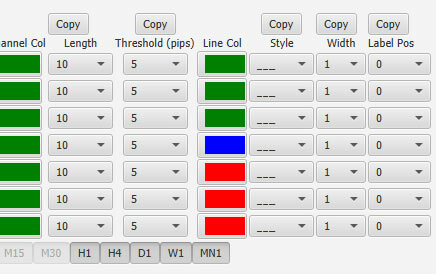 Colours, lengths, label positions, styles etc The JFX interface allows complete control over all visual pivot components. Modification and changes can be made in a couple of mouse clicks rather than having to delve into MT4 external input parameters tabs in every indicator loaded on each chart. Custom Profiles The trader can create timeframe specific profiles for the same indicator on the same chart... in other words you can have a pivot layout which is specific to GBPUSD on the H1 chart but also have a completely different configuration on the M30 or M1 chart... there is no need to load new profiles when the chart timeframe is changed - if the profile is present MT4 will auto load the stored profile for the specific timeframe. This functionality isn't possible with standard MT4 tools. The Java FX based alert module provides a far more sophisticated pop up alert module than the standard MetaTrader MT4 version. Traders can see the alerts in a table structure which can be sorted based on their criteria. The table columns can be resized columns can be hidden using the buttons at the bottom of the interface. The alert modue shows the Date, Time, Symbol, Period, Alert Condition and also the Soundfile (.wav file) defined for the specific chart and trendline. The Java FX versions of the FX AlgoTrader products allow traders to set up alert profiles which can be specific to an individual timeframe - this means traders can create different parameter configuarations/display options and accompanying alert sounds for individual timeframes if they wish to. This is a unique feature of the Java FX interface. Ultra quick parameter changes - traders can change parameters within seconds! Just click the interface, make the required changes and they will be reflected in the underlying indicator when then next tick is received! Traders can control multiple charts from a single external interface.... there is no requirement to drill down into each chart and scroll through long external input parameter lists! Traders can define profiles which allow a pre-defined set of parameters to be applied to a new chart with a couple of mouse clicks! 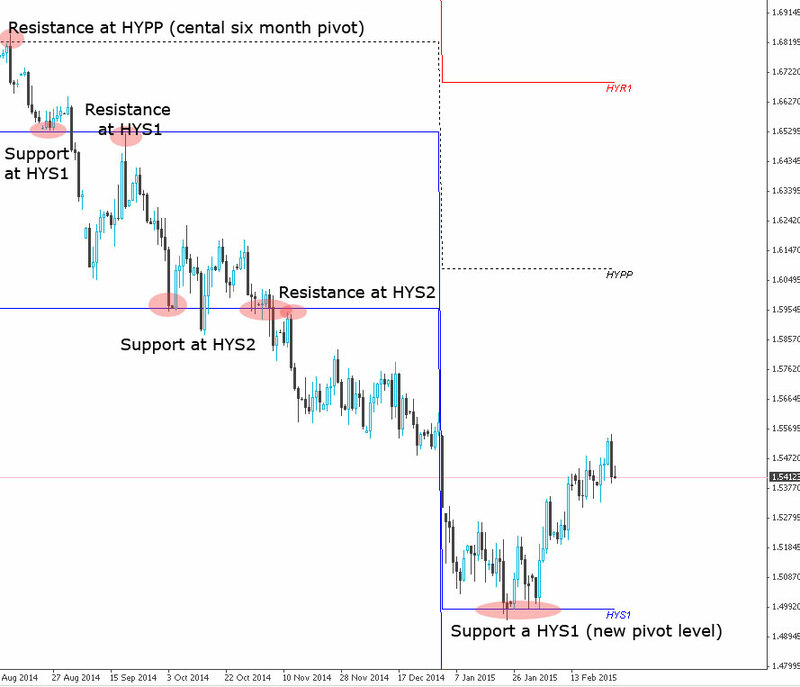 This approach creates a very powerful toolset for traders who perform top down analysis as specific parameters can be optimized for specific timeframes. Due to the limitations within MetaTrader we can only overlay upto 8 line traces simultaneously. 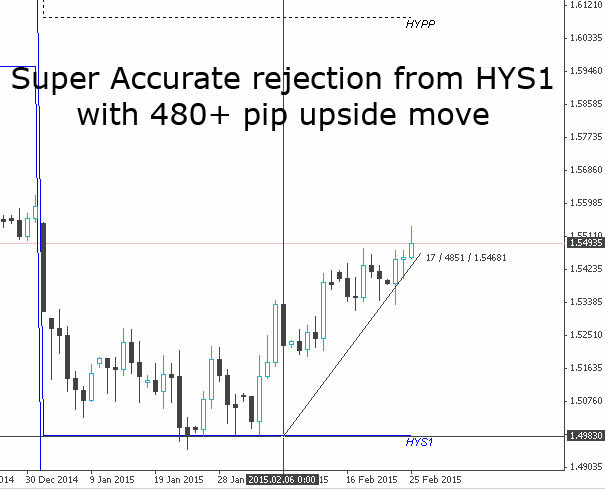 Therefore the indicator supports the major support and resistance levels ranging from HYS3-HYR3. The specific levels are:- HYS3,HYS2,HYS1,HYPP,HYR1,HYR2,HYR3. 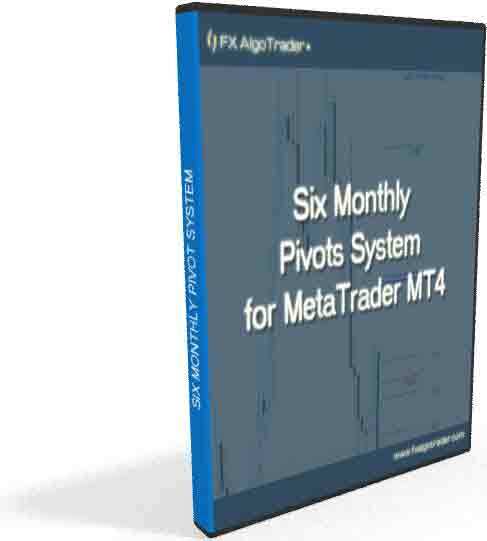 Traders can configure the six month rolling pivots indicator to alert them when price is within a defined threshold (number of pips) from any six monthly pivot level. 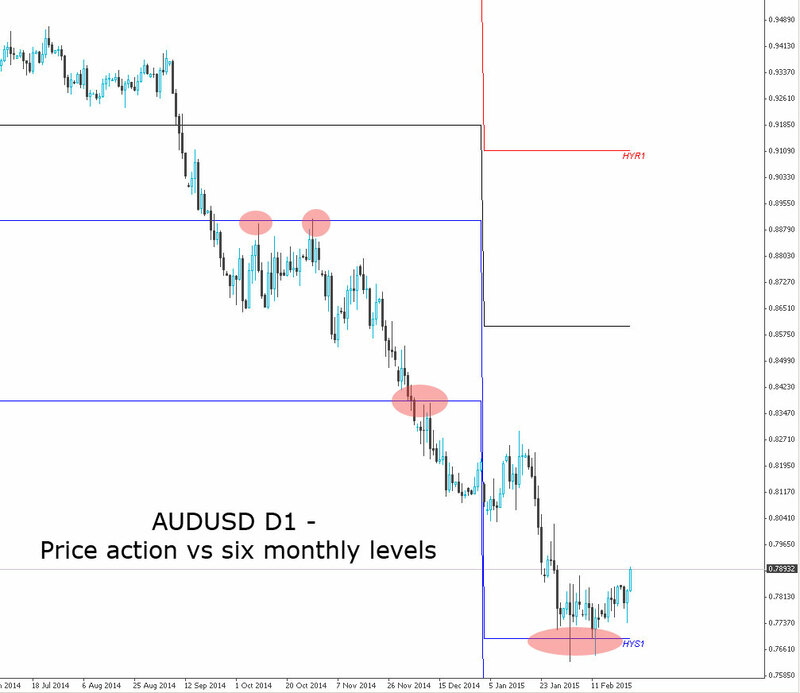 AUDUSD Daily Chart showing price action vs six monthly pivot levels.